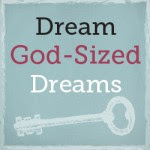 God-sized Dream = A desire in your heart for more of what God has for you. There is this desire in my heart to encourage and inspire women, to be in solidarity with them, to show them that there is hope in Jesus. I think somehow this blog is one way of doing that, as I simply share how the Lord has worked and continues to work in my life, as well as the lessons I’ve learned along the way. Can you relate to any of the above situations I mentioned? Well then, know that you’re not alone. Feel free to share you story in the comments! Or if you just need someone to pray with you, post your prayer request in the comments, or feel free to send me an email at michnicolas(at)gmail(dot)com. God bless you! Welcome to the blogging world Mich. And you are a wonderful writer. Thank you so much for your encouragement over at my space! Bless you friend for reaching out and sharing your thoughts and your God-sized dreams. Hi Tonya! I'm really enjoying this whole blogging thing. Thanks for your encouragement as well! May the Lord, our Dream-Fulfiller, make all our dreams come true for His glory! Hi! I appreciate your visit to my blog, Everyday Ruralty. I like your blog, and I smiled at the story of your marriage proposal. :)I see you haven't been blogging long. This summer will be three years for me. I think you will really enjoy having a blog. I hope you will drop by again. On Tuesdays, I have "Chats on the Farmhouse Porch" where folks answer 5 questions and we visit each other's blogs to see the answers, offer encouragement, and get connected with other bloggers. Most of the people who join in on this are Christian women, who are so uplifting and encouraging. Drop in next week and see what I'm talking about. Have a good rest of the week and weekend! Hi Patrice! Thanks for dropping by, too! And thanks for the invite! Hope to visit soon! God bless you!